The first Alphonso mangoes from India have reachd Europe after the lifting of the EU ban. 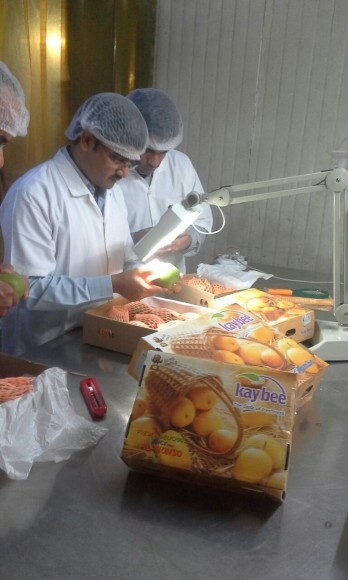 Kay Bee Exports has successfully shipped a consignment of Alphonso mangoes to the UK, after it underwent Vapor Heat Treatment. The EU banned Indian mangoes and four other vegetables with effect from 1 May 2014, bringing the 2014 mango season to a halt. There was a re-audit in September of last year, and following assurances from the Indian government the ban on Indian mangoes was lifted earlier this year. The mangoes now either undergo either a hot water treatment prior to export, or the Vapor Heat Treatment, used by Japan to eliminate the fruit fly and proposed by the Indian Agriculture and Processed Foods Export Development Authority (APEDA). Prakash Khakhar, of Kay Bee Exports, praised the “untiring efforts” by the ministry of agriculture. “Mr. A. S. Rawat, Dr. Sudhanshu and Mr. Ravindra from APEDA assisted the trade in getting the VHT protocol approved for exports to Europe. “Mr. Milind Akre and Mr. Tambale from MSAMB (Maharashtra State Agriculture Marketing Board) readied the VHT facility in quick time. Dr. Patni and his team of Pythosanitary inspectors inspected the first shipment before issuing a Pythosanitary certificate,” he said. Kaushal Khakhar, CEO of Kay Bee Exports, said he is confident that with good backward linkages and effective post-harvest treatments, India will be able to offer pest-free fresh produce to importing countries around the world. He also thanked Defra, in the UK, for assisting the exporters’ association with valuable information. “Kay Bee is gearing up for a strong mango campaign in the coming months with exports planned to various countries in Europe, USA, Middle East and South East Asia,” he said. Kay Bee Exports sources mangoes, known for their soft flesh and thin skin, from certified orchards in the states of Maharashtra and Gujarat.